I met the group that I was going to be trekking with; a sweet couple from Hong Kong, Karl and Sin, and Warren from USA, who would come to collect such epithets as "Inspector Gadget", "Mr.Colorado" and "The fittest 46yr old I know!". 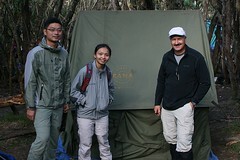 We also met our guide, Richard a.k.a Richie, whose big smile was to be one of the hallmarks of the trip. We reached the base camp and found a whole carnival in action. 361 hikers had signed up to start this trek this particular day. 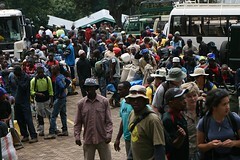 Kilimanjaro trail is a popular one, but this was a record and the registration desk at the base camp was ill-prepared to handle the crowd. It was lunch time before the procedures were complete and we were set to go. 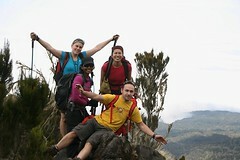 We popped in our packed lunch boxes and set off into the equatorial forests that cover the base of Kilimanjaro. On the way we met five kiwis who called themselves the Kea tribe; Bridie, Veronica, Rory, Josy and Tess would turn out to be a major source of fun for all of us. We reached the Machame Hut (2900m amsl) by dusk after walking about 12km. To accommodate the unusually high number of hikers even pathways were taken up for tenting and the place looked not unlike a section of Dharavi. When I snuggled into my sleeping bag after dinner it felt comfortably warm. That was a little worrying because the outside temperature was 17 Celsius and my tent and sleeping bag were going to be put to the test at harsher conditions very soon. But there was time to worry about that tomorrow. What's trending in the auto-wisdom scene?